Segmental overgrowth means that some parts of your body have grown larger than they should be. Why do these parts grow bigger than usual? They have an overactive switch controlling how fast they grow. Your body is made up of millions of tiny cells. Inside each cell, there is lots of machinery which allows you to make energy, move and grow. There are many switches controlling these things. 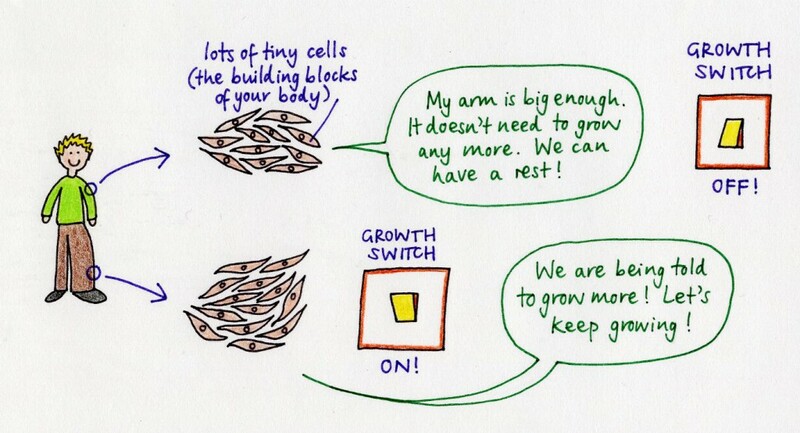 In the large parts of your body, one of the switches controlling growth is turned on more than it should be, so your cells grow and divide very quickly. It started when you were a tiny baby inside your mum’s tummy. In one part of your body, a small change happened in your DNA. DNA is like an instruction booklet which tells our bodies how they should be made. So in this part of your body, the instructions were different from the instructions in the rest of your body, and that is why your body grows a little bit more quickly here, but normally elsewhere. Will the overgrowth ever stop? Some people stop growing when they become adults, but other people keep growing. We don’t know why, or which group you will be in, but we are working hard to find out! Can doctors do anything to stop or slow down your overgrowth? Now that we know what is causing overgrowth, we are getting nearer to finding a good treatment! 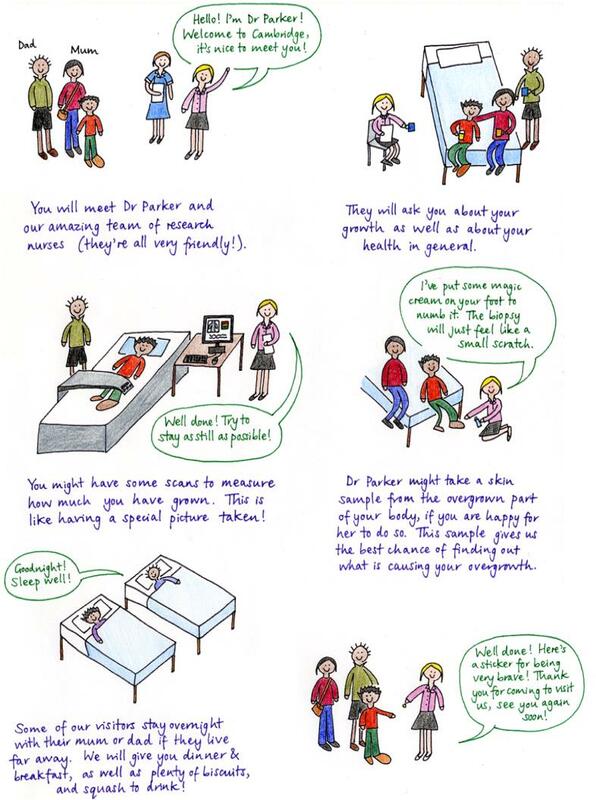 At the moment, some patients are trying a special pill which we hope will slow down their growth. It is still a very new medicine, and we don’t know yet how good it is. Your parents and doctors may talk to you a bit more about one of these drugs – (it’s called “sirolimus” or “rapamycin”) and we may even ask you to be involved in a proper trial to see if this drug works or not . We are also looking for other medicines which may be even better. If part of your body is bigger than usual, we would love to hear from you! We will try to find out what is causing your overgrowth and even see if we can help treat it and stop it growing. Also, by meeting lots of people with overgrowth, we hope to learn more about it so that we can make better treatments to improve your life and the lives of other people like you.